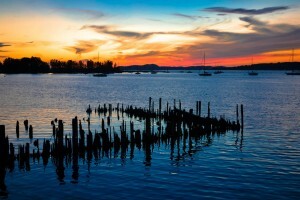 Muskegon, Michigan is a beautiful city filled with history and amazing views of several bodies of water including Muskegon Lake, Bear Lake, and Lake Michigan. The Muskegon area is not only a great place to live; it’s also a popular vacation destination because of its beaches and summer time cultural events. Muskegon Lake is nested between the city of Muskegon and North Muskegon and has access to Lake Michigan through the Pier Marquette channel and access to Bear Lake through the Bear Lake channel. This makes it ideal for boaters who want the freedom to explore multiple bodies of water. Muskegon Lake is one of the most desirable lakes to live on in West Michigan because of its breath taking views and diverse scenery. It’s the largest inland lake in Western Michigan and also the only deep-sea port with access to Lake Michigan. This means that it is the host to the Lake Express ferry, Milwaukee Clipper, several cruise ships docking at Heritage Landing. There are also many rental properties and vacation homes on the lake and in the Muskegon community that makes it a perfect place for tourists to visit and take in the scenery of Pere Marquette Lighthouse and Park. 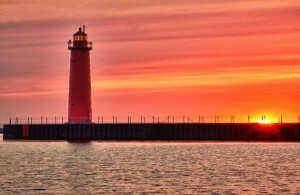 Muskegon is home to several historical landmarks and numerous summer time events. The downtown area is full of history and pays homage to its logging roots with the historical district that includes the Hackley House and Hume Home. These historic homes allow you to see into the past and catch a glimpse of a nineteenth century upper-class lifestyle. Continuing the historical tour of the area, Muskegon is home to the USS Silversides WWII Museum. This submarine fought in numerous WWII battles and has remarkable story. It’s docked next to the US Coast Guard Cutter Mclane just down from the Coast Guard station. Also docked in the Muskegon downtown waterfront is the LST 393. This WWII warship museum is home to events like Movies on Deck where they play historical and popular movies on the top deck during the summer. Watching a movie out on the water with the sun setting in the background makes for a great evening for friends and family. The downtown lakeshore area also is home to the newly built farmer’s market where local farmers, artists, and bakers come to sell their unique goods. Muskegon is also a proud home to the Muskegon Lumberjacks Hockey team who play in L.C. Walker area. 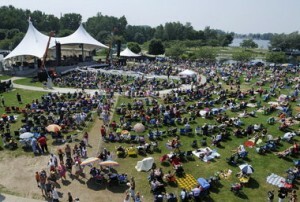 Muskegon’s Heritage Landing is a beautiful park on the waterfront that boasts one of the area’s best concert venues. During the summer, numerous events are hosted here including the Michigan Irish Music Festival, the Unity Festival, and Moose Fest. The beautiful views from the lakeshore park combined with the convenient location make it great place to go during the summer. Muskegon is also home to Bike Week, a motorcycle event lasting a week where thousands of motorcycle enthusiasts come to show off their bikes and take in the breath taking scenery. The area is also known for its golf courses and Yacht club. If you are interested in homes on Muskegon Lake, make sure to look at our Muskegon Lake listings page to see what is currently available in the area. If you have any questions or simply what to look at a home, please fill out our contact form or give us a call. We’d love to schedule a showing with you.